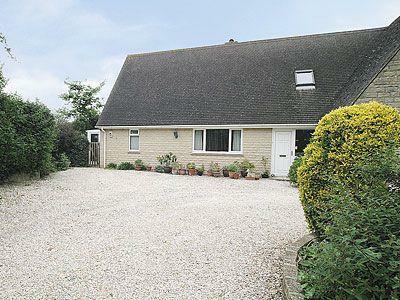 A self-contained ground floor annexe, with conservatory, attached to the owner’s detached house. 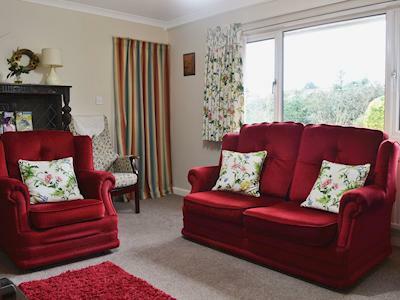 This light and airy holiday apartment is situated on the edge of a pretty Cotswold town and offers an excellent base for touring and sightseeing. The towns of Burford, Bibury and Cirencester are within a 10-mile radius. Cirencester, the Cotswolds capital, has twice weekly markets and many historical attractions from museums to churches. Regular craft fairs, antique markets and festivals are held throughout the year. 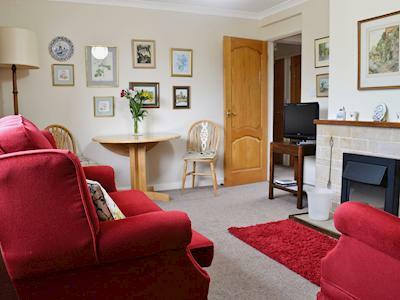 There is excellent walking in the nearby Cotswold Hills, or enjoy watersports at the Cotswold Water Park close by. Shop and restaurant 0.5 miles, pub 400 yards. 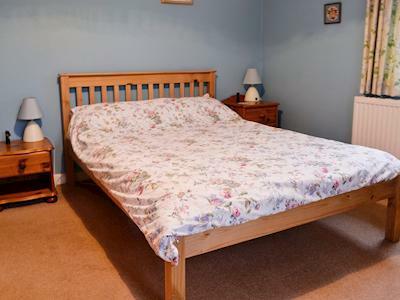 All on ground floor: Living room with single sofa bed. Kitchen. Conservatory. 1 double bedroom with French doors. Bathroom with shower over bath and toilet. 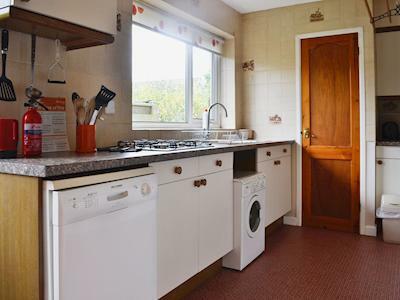 Gas CH, gas, elec, bed linen and towels included. Travel Cot. Highchair. Freeview TV/DVD and small library. Gas cooker. Microwave. Washing Machine. Dishwasher. Wi-fi. Enclosed lawned garden with furniture. Parking (2 cars). Branca opened its doors in late 2000, offering Oxford a contemporary Italian bar and restaurant. The restaurant seats 110 and serves nothing but quality food with quality ingredients. Formerly a florist and greengrocer, Gee's, Oxford's fine dining restaurant, was converted by present owner Jeremy Mogford 15 years ago. The menu is based on seasonal food, local produce and fine ingredients. Broadway Tower is the Cotswolds highest castle, it is an unusual Capability Brown Folly and of huge architectural interest. From the summit of the Tower you can see for an interval of 62 miles, in fact you can see 16 counties from here, it has astounding vistas. Within the Tower is a series of interesting exhibitions that take you back in time, it covers the lives of the Earls of Coventry, William Morris, quirky collectors and wartime heroes, there is even a Cold War bunker here, but it is only open on the weekends and specific days. Located along the Cotswold Way it is a big draw for cyclists, walkers and wildlife enthusiasts who come to enjoy the peace and tranquillity here and see the beautiful Red Deer that roam the area. As you climb higher you can feel your stresses floating away as you escape from the hustle and bustle of life. Here it is just you and the great outdoors, the noises of nature and amazing scenery. It is a great place for a family day out, the children have loads of space to run free, play ball, ride their bikes, fly a kite the list goes on. Take a picnic or enjoy the surroundings of the Morris and Brown Cafe, where there serve refreshments and light snacks that are tasty and delicious. Or shop in the onsite shop that serves a delightful collection of items from local and up and coming designers all at reasonable prices. 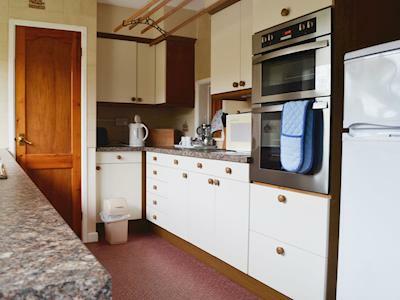 Fresh British Farm assured chicken, lashings of freshly prepared salad — meals are cooked to order in open view kitchens. Early bird meals on offer before 6.30pm. 13,000 sq foot of indoor play area for the children to enjoy with a separate area for under 4's and an on-site café. Groups of two to four travellers who want to get the most out of their stay in Cotswold can schedule a Tour Gems day tour! Climb inside an air conditioned 8 seat people carrier and let your guide do the driving. Standard tours cover much of the region's lush landscape with trout-filled streams, valleys and views atop the Cotswold Escarpment. Explore the Cotswolds in luxury with Pegasus Chauffeur Services! This reliable tour option allows visitors to see the sights at their own pace with a custom itinerary. Route and times can be altered as necessary and the traveller an enjoy a private excursion without the hindrance of a larger group. Snakes and Ladders is a huge indoor playground fitted to the brim with climbing frames, ball ponds, cargo nets and slides. A ride on electric motor bikes is also not to be missed. Delve into the dark side of Oxford's alleyways and streets and find out about its ghostly past, if you dare! With its many colleges and historic buildings, it's a great place for ghostly goings on. On this tour you can visit some of the scenes seen on the TV show Inspector Morse, with lots of stories along the way. See the places where the famous TV detective cracked the crimes of Oxford. Sandford Park is Cheltenham's outdoor heated pool complex, in a picturesque setting with landscaped gardens. There are heated changing facilities available as well as an on-site café. This is a large outdoor heated swimming pool with free swimming for kids, relaxation area, outdoor play area and refreshments. The Warehouse offers supervised indoor climbing for children aged 8 — 16 years. Children's parties, school groups, AALA licensed. Outdoor walking, canoeing and map-reading are also available. The Westonbirt National Arboretum in Gloucestershire provides idyllic landscape for a peaceful day of fresh air and nature. This historic area features Victorian influences and an enormous collection of healthy trees and shrubs overseen by the Forestry Commission. The grounds nurture over 2,500 tree species and a total of 16,000 individuals that have been brought in from Chile, Japan, North America, China and Britain. Escape from the hectic atmosphere of modern civilisation and immerse yourself in the serene landscape of the Cerney House Gardens. This lush space features vibrant blossoms and deep green hues that will enchant the mind and the eyes. Observe local wildlife and tranquil woodland while exploring 40 acres of gorgeous parkland. The park has a visitor centre that houses countryside displays and a café. There are also exciting adventure playgrounds for toddlers and older children, including an aerial runaway. The beautiful Birdland Park and Gardens was founded in 1957 in the village of Bourton-on-the-Water. This location was among the first bird encounter attractions to open in the United Kingdom. The facility features 9 spacious acres with more than 150 trees that form lofty canopies for the facility's beloved feathered residents. The Dragonfly Maze is more than a beautiful garden. This exciting attraction also holds many surprises for curious visitors who successfully unravel its secrets. Gather your clue card at the start of the journey then attempt to make your way to the centre, gathering new clues displayed on engraved flagstones. Organic and sustainable principals have made Highgrove Gardens a beautiful place that is as self sufficient as it possibly can be. Explore peaceful wildflower meadows in two main areas: Highgrove and Transylvania. Individual and group tours are available as well as Champagne Tea tours. Book a garden tour now and buy one as a gift for a friend! Here there is space to run and play with beautiful parkland and a waterfall to enjoy. Kids love coming here time after time is because its home to one of the best adventure playgrounds in the country. HIllfield Gardens have a long and interesting history, particurarly with regard to leprosy and disease control in the city, and can be dated back to around 1869. These secluded gardens were planted to compliment the intricate Victorian Hillfield House that stood on these grounds. Today a lot of work is been undertaken to bring them back to their former glory, they still provide a place of beauty and an air of peace and tranquillity within, the town. Within the garden there are three mature Redwood trees, a champion oak and some of the oldest surviving trees to be found in Gloucester. In addition there are three important historical monuments: Scriven's Conduit, the King's Board and the chancel of the 12th century leper chapel of St Mary Magdalene. During a recent archaeological dig they have uncovered the remains of a Roman road and there are lots of ancient gravestones that make for interesting reading. They are a number of events that take place in the grounds during the year including music concerts. Hillfield Gardens provide a nice choice of walks and lots of room for young children to run free, climb and explore, they provide for a fun and enjoyable environment for all. In 1991, the Abbey Home Farm switched from conventional production to organic. The 650 hectare property offers seasonal tours and trailer rides. Visitors can also explore walking trails and a 6 miles circular walk which is canine-friendly. Browse the charming organic farm shop and stop by the on-site cafe for a meal with relaxed, rustic atmosphere. Pick a Pot and Paint offers a fun way to spend an afternoon. Visitors can stop by and choose a ceramic piece from a huge collection of pre-made items found in the Pick a Pot shop. The item can be taken to the sketch studio to begin work on a unique design. The guest can select colours and paint while the shop glazes and fires the piece then arranges delivery afterward. Come and experience the colourful fun and excitement that is the Giffords Circus! This extravaganza of entertainment began in 2000 as a small, traditional circus company with big potential. Today the troupe tours with waggons baring musicians, performers, horses and many other unique elements that make this captivating show so memorable! Gloucester Ski and Snowboard Centre is the utmost place to come to for a true snowsport experience all year round. There is so much to get involved with here and it offers fun, excitement and thrills for all ages and abilities. It boasts the longest dry ski slope in England and Wales as well as having the only permanent Big Airbag in the UK. There are so many activities available with skiing, snowboarding, tubing and snoxross bikes. The equipment is all well maintained and before you start an activity you are given a safety briefing and talked through the equipment. Please be aware that all participants aged under 16 are required to wear a ski helmet on the slopes, they can be hired here too. The staff are fantastic, friendly, professional and enthusiastic, nothing is too much effort for them. There is a cafe that serves a selection of snacks and drinks a nice place to chill and recover after time spent on the slopes. Gloucester Ski and Snowboard Centre is a great year round attraction that can be enjoyed by all ages and fitness abilities, fun for all, highly recommended. A city centre cinema showing up to date films (check website for times). Free and disabled parking is available and the centre is wheelchair friendly. Formerly The Oxford Apollo, now under the name of New Theatre, this exciting venue offers a wide range of shows and events — check the website for up to date listings. The Richard Hagan Gallery focuses on Original Contemporary British Art, it is housed in a charming 17th century building that is full of character. The gallery is open daily during the year and has a continually altering display of excellent paintings and sculptures, in addition to some permanent displays. During the year there are three inclusive group exhibitions. The main focus at this gallery is on the finest in Scottish contemporary and Cornish art. The paintings and objects on display here lean more to the modern representational and abstract. The Kings Theatre, patronised by Prunella Scales and Timothy West, puts on a variety of shows and events — check the website for up to date shows. Gloucester Archives is the place to come if looking to get information on former residents, local and family history resources relating to Gloucestershire. The archives are available to the public and can be accessed in the public research room here. Records here go back as far as 1100 right through to present day and include millions of records that have been donated or loaned to Gloucester Archives, it is one of the foremost preserved collections in Britain. The centre is open Tuesday through to Friday and a half day on a Saturday, and there is no charge although donations are appreciated to enable them to keep the service open. The public research room and facilities do not require advance booking you can just call in however, you will need recognised identification and are required to complete a registration form. It is probably best to order documents in advance so that they are available this can be done by looking at the Online catalogue. The staff here are brilliant, very helpful, obliging and professional. You also get free Internet access to the genealogical sites from here too. Gloucester Archives is an intriguing and informative building, even if you don't have any local connections the information here is interesting and you get a true feel to the history of the county. The Old Silk Mill offers a cooperative of more than twenty artists and craftspeople a venue to showcase their crafts and talents in this historic building. The Old Silk Mill is also known as the home of C.R Ashbee's world acclaimed Guild of Handicraft who inhabited the property from 1902 to 1908. There continues to be a representative of the Guild at the Old Silk Mill through Hart Goldmiths and Silversmiths and you can see these and other artists at work here, it is like stepping back in time. In addition they are more than happy to discuss their work with you. The Old Silk Mill provides the perfect conditions to exhibit these works in a bright and airy environment with a welcoming atmosphere. You will find a combination of contemporary and traditional craftspeople, they include artists, ceramicists, designers, furniture makers, glass makers, metal workers, photographers, sculptors, stone carvers, textile artists and wood carvers. The aim of the co-operative is to help expose and develop the artists profiles and allow people to meet them and discuss their works. Each member will have the opportunity to administer the co-operatives numerous exhibitions. The gallery is open each day from 10am to 5pm. There is a lovely coffee shop that has a inviting and relaxed ambience where you can enjoy a good selection of tea and coffees and some delicious cakes/biscuits that offer great value for money. Do take the time to visit the Old Silk Mill it is a true working museum and has a really nice selection of exhibits and also offers the opportunity to purchase a unique gift. The Barn Owl Centre opens it doors to visitors every Saturday from 11am to 5pm, although the predominant role of the centre is the conservation and wildlife of bird welfare. The centre is in its infancy and has a way to go to get to its final stage but this does not detract from the important role they provide. The centre specialises in looking and caring for barn owls and birds of prey, they are kept in superb conditions and are so well tended for. What is immediately evident from the staff here is there unwavering dedication and enthusiasm they have to these stunning birds. Their enthusiasm is infectious and they are so friendly and knowledgeable they manage to engage everyone and you learn so much during your time here. There are a number of experiences and products on offer including the opportunity to interact with these majestic birds during a unique nature experience, or during the barn/hawk owl experience you can learn how to fly these birds, the groups are kept small to ensure everyone gets time to hold the birds. There are plenty of photo opportunities but, if you are a keen photographer then the photography day will be perfect for you. You can also adopt one of these amazing birds as a gift for yourself or a present, it is a great way to help support the centre and the birds. A visit to the Barn Owl Centre should be high on your list of things to do, it is a fantastic experience and should not be missed, you will not be disappointed. Cotswold Lavender are probably the prettiest and nicest smelling fields that you will ever see, you are invited to come and visit them on their farm to see for yourself the beauty of these fields. Generally open from June to August when the lavender is in bloom, you are welcome to come and walk the fields and distillery. The harvest will take place when the crop is ready and this cannot be predetermined, it then needs to be distilled immediately after cutting, it is only on these times that the distillery will actually be operational. Located in a splendidly renovated Cotswold Stone barn on the premises are the lovely Gift Shop and Tea Rooms. The Gift Shop stocks the complete range of products they sell from lavender plants, dry lavender bunches, the best English Lavender Essential Oils and their best seller the Slumber Gel, there are loads more products available here. The Tea Rooms are cosy and welcoming and sell refreshments and light snacks as well as a selection of cakes and pastries for your enjoyment. Cotswold Lavender offers a unique and unusual day out that is interesting and enjoyable for all the family. The Court Barn is an old tithe barn that itself is interesting but, housed in this historic structure is an exhibition relating to the Arts and Crafts movement in Chipping Campden. The exhibits on show are well presented and are all relevant to the local area or by local artists showcasing their works and talent. The staff here are very friendly and enthusiastic and really enhance your visit to the Court Barn. It is an intimate venue but the quality of work on display is fantastic and there are some really nice and unique items available to purchase. There are some interesting videos that demonstrate how certain items are made. It does not take you very long to get around the museum but, nevertheless it is interesting and informative and throws considerable light on the Arts and Crafts movement and its legacy here in the Cotswolds. If you are in the area then a visit to the court Barn Museum is worthwhile. The Regal Cinema is more than just an ordinary cinema it is an entertainment venue that hosts a whole range of cultural events, from films, live performances, comedy, art exhibitions, keynote lectures, live sports feed, fashion shows and more. The building has been lovingly restored and has kept many of the art deco features and the toilets are particularly glamorous. During the day there is an elegant coffee shop where you can relax with friends with a coffee and a light refreshments, at night this area is transformed into a wine bar that is trendy and vibrant. Patrons to the venue have a number of options when it comes to watching a film, you can sit at a candlelit table, get cosy in the double love seats, take a regular seat or one in one of the Royal boxes. They show a variety of films from blockbusters to independent. With comfy seats, a waitress service to your seats and reasonable prices the Regal Cinema makes for a great time out. It is different to modern cinemas but definitely worth a visit. Avon Leisure Cruises offer specialist river cruises aboard their two boats on the River Avon. Both are comfortably decorated, weatherproofed, heated, with toilets, a bar and panoramic windows allowing unrestricted views of the river. They are available for private hire and offer the ideal party venue, they can cater for you or you can take along your own food and drink. A basic cruise will last for about one and a half hours but longer cruise times can be arranged or you can include a stop at the gorgeous historic village of Fladbury, you can entertain yourself whilst you are here or take a visit to the Lock and Mill. They also offer a three course Sunday lunch cruise, the perfect way to spend a relaxing Sunday. As you cruise along these tranquil waters you will encounter some beautiful countryside, and you will feel yourself relax and unwind as you meander down the river. The staff of Avon Leisure Cruises are friendly and attentive and you are well looked after whilst you are onboard, they will ensure you have a thoroughly enjoyable experience. Life Emporium gives local artists, artisan producers and businesses a base from which to promote and sell their goods. All goods are displayed in a tidy and orderly fashion with each trader taking a stand in the appropriate department for their goods. All goods are clearly marked with the price and they are responsible for their own goods. There is a great range available here with hand made cards, arts and crafts, gift shops, sweet shop, interior decoration and accessories, personalised hoodies and shirts, jewellery, beauty salon and much more. The store is large and airy and offers a relaxed and casual shopping experience. Life Emporium is the perfect place to come for a unique and individual present whilst supporting local businesses. Evesham Arts Centre is a premier entertainment venue and provides a varied schedule of events from live concerts, dance, drama, comedy, pantomimes, musical theatre, workshops and much more. It is a major part of the community and has a philosophy to encourage both performing and visual arts. In addition to showing professional artists and productions they host amateur productions and local community groups. It provides a modern intimate environment that is comfortable and welcoming, facilities include a fully incensed bar, coffee bar and lounge seating, the prices here are very reasonable. Regardless of where you sit you will have a good visual of the stage area, with friendly and helpful staff, good organisation and a great programme of events the Evesham Arts Centre is a fabulous venue to visit. Everyone is invited to experience the spiritual beauty of the Parish of Cirencester. This fascinating landmark is open to worshippers and travellers alike. Services and events are still held at the church. The attraction is partnered with the Corner Stone book and coffee shop so travellers can enjoy a relaxing break with Christian books, gifts and more. Explore the Corinium Museum and learn more about history and the people who lived it. This facility contains an enormous collection consisting of more than 60,000 objects. Many broad categories are covered, including social history, archaeology, prints and photographs. Each item relates to the Cotswold District. Travellers can also stop by the museum shop to find many unique trinkets and gifts. You are invited to hop on board the famous GWR locomotives and explore hands on the ways of this beautifully restored railway. Learn about the extraordinary people whose stories are embedded in the history of these fascinating trains, from their original conception, to their build and subsequent journeys. Visitors are also told of the life of the maverick genius that was Isambard Kingdom Brunel, who created the GWR. The Cotswold Motoring Museum and Toy Collection is a fun place for families in Bourton-on-the-Water. The extensive collections feature a wide range of exhibits, including the Mill Gallery which is full of sleek vehicles. Visitors can see a blacksmith's workshop or take a journey through Windrush Alley for a closer look at street level motoring. Chavenage: a classic Elizabethan manor house with beautiful stained glass, wonderful tapestries and a fascinating history. Cromwell stayed here; the D-Day landings were plotted here; ghosts have been seen here! Chavenage is a family home, but is opened to the public on certain days throughout the summer, and to private groups by appointment. Please check dates before visiting. Over 40 vehicles are on display. Most are buses in the ownership of the museum. Some are privately owned buses on long-term loan for exhibition to the public. Blenheim Palace is located in 2000 acres of stunning parkland at the heart of the Oxfordshire Cotswolds and yet is only 8 miles from Oxford. It is a world heritage site and well known as the birthplace of Sir Winston Churchill. Gordon Russell Design Museum is a dedication to the life and work of one of Britain's foremost design pioneers, his life spanned many amazing events and changes and these are all documented here. The museum is actually located in the original workshop, and is a celebration of his life and work, over a period of 60 years. Gordon Russell was an extremely talented man and had many skills, he was a furniture designer and maker, calligrapher, entrepreneur and champion of accessible well crafted design. He trained locally and had a belief that a good design could have consequences on peoples lives. He continued to pursue quality and craftsmanship even when he introduced machinery. He was heavily involved in promoting Britian's design industry following the end of World War II, his persistence and dedication had a lasting impression and effect on British industry, design and education. The museum houses a unique collection of furniture that covers many eras from the Arts and Crafts movement right through to the 80's and the introduction of utility furniture. To support these stunning pieces there is a huge archive of authentic drawings, notebooks, catalogues and correspondence in addition to admittance to the firm's original reference library. The museum is an interesting and engaging space that is educational and interesting simultaneously, a great day out for all, the guides are informative and friendly and the furniture on show is superb. St Michaels Tower stands impressively at the tallest point of Gloucester city, and strategically where the four main streets cross, it is a familiar landmark on the city's horizon. It stands 25 metres tall and can be dated as far back as 1465, and has seen many changes and events throughout the years. The tower has recently underwent considerable improvements to become a tower of learning where visitors and locals can delve into the Gloucester's abundant and diverse history. You can take an audio trail whereby you can discover the heritage of the city in your own time, see heritage films that include personal accounts and memories on film, there are a number of exhibits on display during the year. There is also the opportunity to take a guided tour they are inexpensive, and run by friendly, enthusiastic and knowledgeable guides who are happy to impart their considerable knowledge. The tower itself has many interesting features including the stone carvings, stained glass windows, ancient graffiti. St Michaels Tower is the centre in the town for history tours and a great place to start, providing lots of information and things to see. St Mary de Crypt Church is an important and historical part of the Sunday School movement, and dates back to 1137. What is different about this church is the fact it has a crypt, it is only one of the twelve mediaeval churches known to have a crypt, and the crypt here is completely occupied with burial vaults. It is a pretty church has numerous interesting features such as the old Crypt schoolroom, Master Accommodation, Lancet Windows, wall paintings and stained glass windows. The church is open throughout the summer Monday to Friday from 11.00am to 3.00pm to allow visitors to look around, and there is no charge. You will find the volunteers to be friendly, helpful and informative they are very obliging and are happy to point things out and answer questions you may have. It has had a number of well known pupils attend the school here over the years too. St Mary de Crypt Church is a delightful historical gem and certainly worth taking the time to visit you will be surprised by all there is to see and learn. Soldiers of Gloucestershire Museum is a visitor experience that gives an actual insight into the life of soldiers and their families during the past three hundred years. The Gloucester Regiment has been involved in many important and memorable battles over the years. It is an intimate museum and if you follow the layout properly you are brought from past to present day, in the chronology of war. The majority of the exhibits are permanent however, there are a number of temporary exhibits that frequently change so always something new to see during a visit here. One of their new exhibits is the Modern Army Display, here you can get an idea of what it was like to serve in Afghanistan, see the newest equipment, feel the weight of the body armour and the pack, see if you can visualise what it would be like to carry these into extreme temperatures. There are some interactive exhibits, firearms, medals and uniforms on displays, a great mock up of a tank encampment and all exhibits are well laid out and presented and overall the museum is very informative and interesting, it is a real tribute to all service men. There is a charge to visit this museum but it is worth the small fee considering the quality of the exhibits. You do not have to be interested in military history to enjoy the Soldiers of Worcestershire Museum it gives a wonderful insight into soldiers lives and tells some extraordinary stories, definitely worth a visit. Gloucester Folk Museums is an important stop in the historical tour of the city and they have a comprehensive programme of events, that incorporates talks, tours, clubs, exhibitions and activities. The programme is continually changing so it is always worth checking to see what will be taking place. The museum is located in a gorgeous Tudor building and is over several levels and there are some narrow sections as well, so it might not be accessible for all. The museum is filled to the roof with lots of interesting items that cover the history of days gone by and Gloucester. Some of the permanent features includes the cobbler's shop, World War artefacts and equipment, a room from the 60's in London, old farming equipment and tools as well as a stake where Bishops were burnt! There are lots to keep smaller visitors occupied as well with activities, like brass rubbings, questionnaires to complete and old toys to see, colouring and a play area. The exhibits are well displayed and have lots of information on them. Although there is no cafe onsite you can access a catering area and make your own drink from a pod or take a picnic to enjoy in the lovely garden area. The staff are friendly and helpful and are available if you have any queries. Gloucester Folk Museum is a gem of a museum a real treasure throve just waiting to be discovered, lots to see and interest everyone, highly recommended. Grevel House is located at the north end of Campden, and is the town's oldest house. It is an excellent illustration of 14th century architecture, in the Perpendicular Gothic style, with its elegantly decorated windows, its gargoyles, their purpose was to scare away bad spirits as well as acting as rain spouts, and sundial. This historic house was the home of William Grevel and is the first great wool mansion, having chimneys as opposed to just holes in the roof. William Grevel was one of the country's most effective wool merchants. At the time his home would have been surrounded by wattle and daub huts, so you get a perspective of his immense wealth. Unfortunately you can't get inside the house but can admire its beauty from outside. St James' Church is a prominent landmark here in Chipping Camden and this majestic church has been standing here since the 1400's, and can be seen for miles around. It is a renowned Perpendicular Wool church and one of the finest examples in England. There are cards available to allow you to take a self guided tour, it will not take you very long to see this church nevertheless it is still interesting with many lovely features, including medieval altar frontals, medieval cope, stone sculptures, stained glass windows, tapestries and works of silk. Outside there is an old graveyard and the headstones and tombs make for interesting reading and there are some lovely views out over the stunning surrounding countryside. The church relies on donations for its upkeep so there are boxes around where you can make a donation. The church extends a warm and welcoming greeting to all who visit and you are invited to join them in worship, there are services every Sunday and there are other special services throughout the year. If you get to hear the organ being played it is a mesmerising sound. St James' Church is a true gem and if you are in the area make time to visit this beautiful and historic building, you will not be disappointed by it. Gloucester Waterways Museum is located in a Grade II listed warehouse in the centre of the docks here in Gloucester. The museum communicates the story of the canals and rivers. There are a number of interactive exhibits, you get the opportunity to clamber aboard historic boats, watch the archive films and wander amongst the many exhibits and displays portraying the rich canal history, some of the objects have been classified of national importance. There are lots of information on the displays and artefacts and the lives of those who lived and worked on these waterways is well interpreted. It is a great place to visit with small children they get the opportunity to dress up as waterway children and can enjoy the interactive canal lock exhibit, do jigsaws and brass rubbings being just some of the fun things they can do. Throughout the year they operate a number of different events, so it is worth checking to see what is taking place. In addition from Easter through to September you can take one of the popular canal and river cruises, they vary in length and time and incorporate trips to Tewksbury, Saul Junction and Sharpness and include good commentaries. Gloucester Waterways Museum is an ideal day out for all the family as there are areas to interest everyone and the entrance fees are reasonable and there are lots of options available if you want to include a boat trip etc. This impressive 15th century barn sits in a very picturesque medieval hamlet — a glorious setting on the banks of the River Severn. Almonry Heritage Centre is located in a stunning 14th Century building that is full of charm and character. It has had many purposes over the year from an ale house, offices, private home; today it contains a unique compilation of artefacts in addition to exhibitions that describe major events relating to the region including, the history of the great abbey and the defeat of Simon de Monfort, as well as covering the growth and development of Evesham over time. The house in particular is an amazing representation of early English architecture, it has a number of rooms that each house different collections with items from prehistoric times to the 20th Century and include items such a 18th Century clothing, medieval artefacts, furniture, tools and weapons, machinery and much more. Outside there are lovely gardens and again more pieces on display, it is peaceful and tranquil here and you can easily pass a few minutes or hours here. Almonry Heritage Centre is informative and interesting, through the visual exhibits you get a real glimpse into a past era and the lives of the people then, the guides are friendly and informative, a great place to visit for all ages.